2019 is here, and most of us Bullet Journal and personal planner lovers will keep working on them to achieve our goals for this year, doodles will be a part of our daily writing, today I will share a list of things from you can make cute and easy doing doodles. You don’t need to be an expert of drawing or painting to start making cute doodles to brighten up your notes on any Bullet Journal or a personal planner. Doodles are a good thing to work on while you wait for an appointment, or when you need to come up with a good idea or to solve a problem of making a plan or set up some time and hours on your plan to achieve any goal. Starting to draw doodles will help you to get your mind for few seconds or minutes to see any problem from a different point of view, and you will come up with a good idea. Do you remember at school, when the teacher was talking, and your hand just started to draw something on a page, while you were waiting for the teacher to come up with something important so you could take a note on your notebook. After a few minutes, your notes will be the best of the class!. Doodles will look amazing on any piece of paper, and they will help you to decorate any page, but most of all, doodles can also help you to remember any note you took on a piece of paper, it’s easier to remember a doodle than a note. Spring will be soon here, and it’s a good idea to work today to get a few weekly spreads for your bullet journal in time to start taking notes from appointments or for events you will be attending or tasks you need to work on to achieve the lifestyle you want to live. 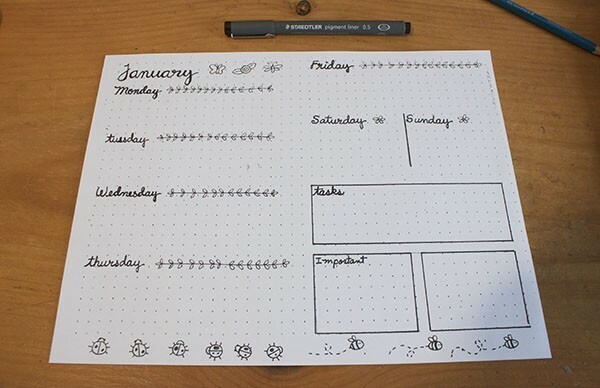 By adding some doodles to a new weekly spread, it will look better and it will help you to focus on the season and do some activities or tasks related to this time of the year. 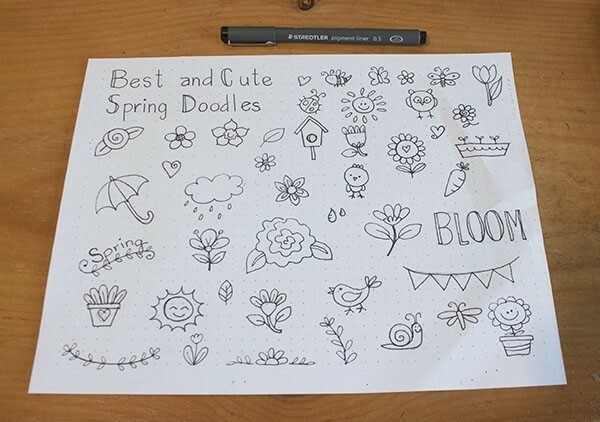 A few straight lines and curves is all you need to start drawing cute Spring doodles! 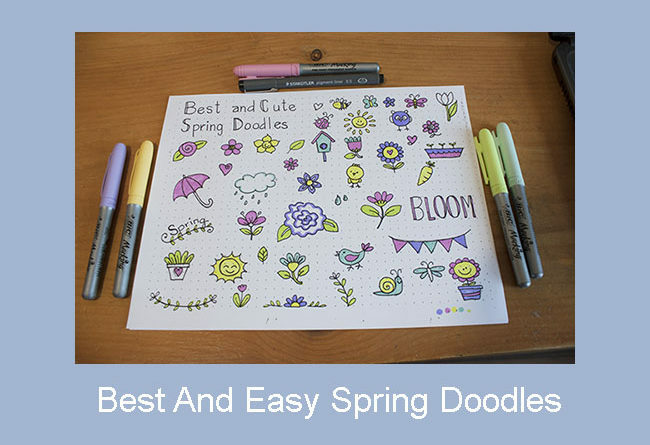 It won’t take long for you to master a few, you can do what I did, just take a white paper and start with a pencil, it will be easier for you to make a sampler page, here I have for you a few Spring doodles you can try to draw. 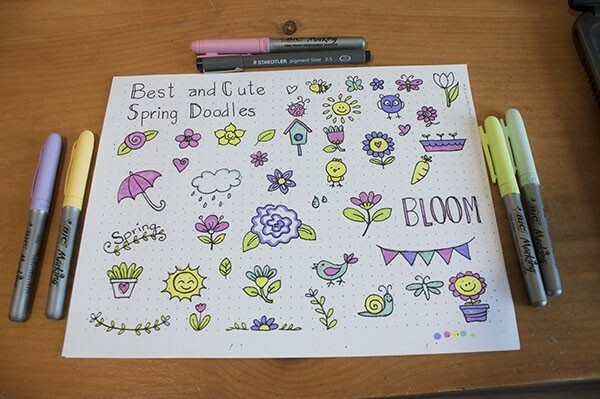 Make Spring doodles big or small, they all will look cute! Once you finish tracing them with a pencil, you can work on them with an ink liner, I have my favorite ink liner, it’s easy to work with all the time, the ink is permanent and it allows me to add color to any doodle I draw with it and it won’t bleed out even if I add color to the doodle with watercolors! You can take a look to this ink liner at Amazon, I always get a few of them, so I always can have one at hand to draw doodles on my Bullet Journal and on my personal planner. After you’re happy how the doodles look when you finish to work with the ink liner. Then the doodles will be ready to get some color. This time I stayed with pastel colors: pink, light blue, light yellow, light green and of course the violet should be part of the Spring palette of color. 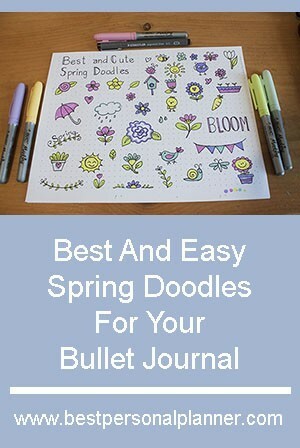 A list of Spring things you can make doodles from. 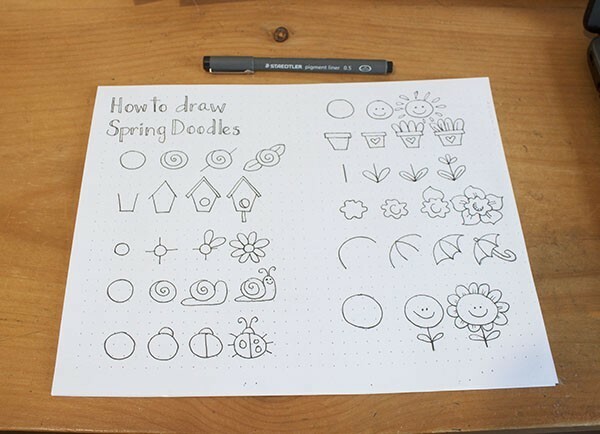 How to draw Spring doodles. If you are a beginner with doodles, I have here for you a chart of some doodles, and how to draw them step by step. This Spring doodles ideas will help you to start working on them, as you practice, you will get better at it. Don’t let a line out of shape discourage you, even those not nice lines we all draw from time to time, they look good on any doodle and they will add your personal style! You don’t need to be a master of drawing to make cute and beautiful doodles! Doodles are easy to draw and they are lots of fun! How to make a perfect Spring weekly spread! 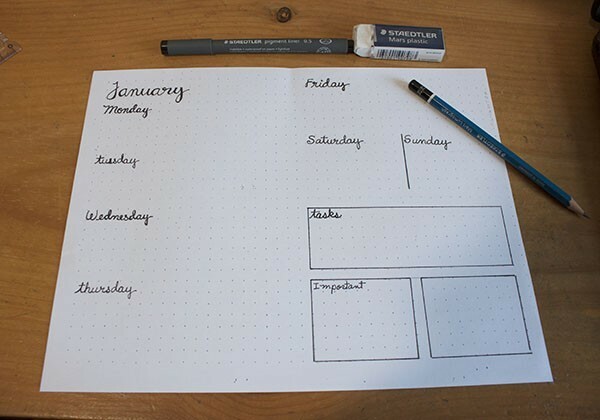 If you’re a minimalist bullet journalist, you will love the weekly spread above, you can make one for you just as it is! You can work on it, and it will help you to get organized and achieve all your goals you have for each week, all you need is to add the dates and this spread will be ready to work on. I like to make one weekly spread like this, and when I finish to work with the ink liner, I make a few copies from it to save time. All I need is to glue the spread to my Bullet Journal in case you have a notebook, or punch the holes to add it to my Bullet Journal as I work with rings on it, it makes it easier to add any new spread on it. Add some Spring doodles on any weekly spread! It’s still winter, but it’s time to start thinking on Spring and all those things we need to work on to achieve all our goals and dreams we all have for this year! Adding some cute and small Spring doodles on a weekly spread will help you to think how nicer weather will be here anytime! Half of the winter has gone by now, and before we all notice, grass will be green again and we all have some flowers blooming in our yards. Well, I hope this weekly spread with some Spring doodles inspire you to make yours at home, once you finish making one, make a few copies of it, this will save you tons of time, time you will love to have to work on anything you have to make your dreams a reality! I thank you for stopping by to read my blog, if you have any question about this article, leave your question on a comment, I will reply to you soon. More doodles ideas to draw on your Bullet Journal or personal planner with time for the season. Best and easy Christmas doodles. Easy and cute Fall doodles. If you find this article helpful and you want to come back later, you can PIN it so you can find it later! I really love your Spring doodles! But I would never have thought of using them to brighten up a weekly planner, that really is a great idea, and one that I will definitely use. I think that most of us will doodle when we are faced with a blank sheet of paper – I know that the notes that I used to take when I was at College are covered on doodles! Weirdly, I think that they can also help with your concentration – well they did for me! I am a bit rubbish at drawing in general, but I seemed to be able to make some really good doodles in spite of that. Your post is really original, and full of great ideas – many thanks. Happy to see you stop today to read my blog! How amazing is to have a page full of doodles, isn’t it? I don’t know why teacher do not allow students to do it, it will help students to be more creative and to remember better everything on any class! I’m sure your doodles are great and beautiful! It seems to me here that the best personal planner one can have is doodle. This will make one schedule easier and get one ready to work. The best part about this site is that you don’t have to be an expert before you can draw it. The site will take you through a step by step instructions to draw them to make our plans beautiful, to be able to work towards our goals and achieve them. Thanks. Thanks so much for stopping by to read my blog today! Drawing doodles will help you to make any plan beautiful and it will be easier for you to remember everything you wrote down to achieve your goals. By drawing doodles we all help our brains to pay more attention to what we write! Keep at it, and you will achieve all your goals! Thanks so much for visiting my blog and leave a comment to share your ideas when picking a new planner and cute stuff to work with it while you make plans. I love to work with any kind of pens, but one of my favorites are gel pens, when you want to work on both sides of the page, I will suggest to get a planner with good paper quality. By doing it, it will be easier for you to try a few different pens to work with! I am indeed a beginner in drawing doodles, I love them but don’t know how to draw them and will love to learn because I want to be a fun dad, having to draw them along side my children will Make me happy and you making this post made it a lot easier, giving tips on how to draw them. Thanks alot much appreciated. I’m sure you will do great drawing doodles and you will have great time with your children, there’s nothing better as a teacher to draw doodles than children. Just have fun, and let your children to have fun too. you both will have fun and will make awesome doodles, I’m sure of that!